Pardon the delay, but I have had a couple of grandson days since the last post. Not much else gets done. In the last post I spoke of the mountainous road east of Sinop, and of the rare opportunity to pull off the two lane highway. The first time we found a place to safely pull off the road we stopped to make some photos. I walked a few yards away from the car to find a clearing for a photo. When the entire group of about 15 cyclists pulled in around our car which was up the hill a short distance from where I was, I thought of the old joke about the tourist group that got lost in cannibal territory. The cannibal leader told the group, “You take the bus and leave the driver for us.” I was able to snap a photo of Leon making a fast get away from the group. But the car is totally hidden from view by the cyclists. Cyclists on the mountainous road east of Sinop. Photo by Ferrell Jenkins. After conferring, Leon and I decided we should get to the car while there was opportunity. As we approached the cycles I noticed that most of the tags, and some of the leather jackets, bore the designation Estonia. When we spoke in English, several of the riders tried to communicate. The best English speaker in the group was from Russia. He told us that they were riding around the Black Sea. An Estonian proudly showed me his shirt with a screen print showing the Black Sea and the names of the major places they were visiting. I think his smile tells how our encounter turned out. The Black Sea is slightly visible far below us. Cyclist from Estonia making a circuit of the Black Sea. Photo by Ferrell Jenkins. Uneasiness past, we said good-bye and went on our way to Samsun. It was a nice experience; the sort that we often encounter in foreign travel. The news sources are reporting that Italian officials are seeking $32 million in funds to repair the crumbling Colosseum. This is in exchange for advertising rights. I have been trying to envision how it might look. This is how the Colosseum might look with advertising. Photo by Ferrell Jenkins. Overnight we lost 3380 hits. Long ago I put a simple counter, supplied by WordPress, on this page. There is also a stats chart that I can see when I login. The chart was based on some time zone other than the one in which I live. So, each morning when I am home I write down my own daily stats. When I opened the page to do that this morning I noted that I had 3380 hits less than yesterday morning. What happened to all of my readers? Maybe you had been reading and decided to take it back! I don’t know what happened, but I see that WordPress has changed the stats chart to match my time zone. I don’t know how that could have messed up the total number. Anyway, deep in my heart I know you have been here. The count this morning should have been about 170,685 +/-. I was looking forward to a big 200,000-hit party and inviting each of you to come read and see. Don’t know what I will do now. More importantly, my ranking at Alexa has continued to improve significantly. Thanks for coming my way. At Edfu, 64 miles south of Luxor, we visited the temple of the sun god Horus who is represented by the falcon. Begun by Ptolemy III in 237 B.C. and completed by 57 B.C., it is the finest example of the ancient Egyptian temples that I have seen. At Luxor we saw Alexander the Great represented as a Pharaoh. His successors, the Ptolemies, brought this practice to an extreme in the temple at Edfu. Ptolemy is pictured repeatedly on the limestone walls standing before Horus; Horus is always the taller figure. Idolatry was not something new to the Greeks, of course (Acts 17; 1 Corinthians 8:5-6). There is a scene inside the temple showing 12 priests carrying an ark on poles. This box on a boat contained the important books pertaining to the temple and the religion of Horus. I think it dates to the time of Pharaoh Neco (late seventh century BC). Neco was the Pharaoh who killed Josiah, the king of Judah, at Megiddo. He continued to Carchemish where he met defeat at the hands of Nebuchadnezzar, king of Babylon. A replica of the ark is on display in the most holy place in the temple. 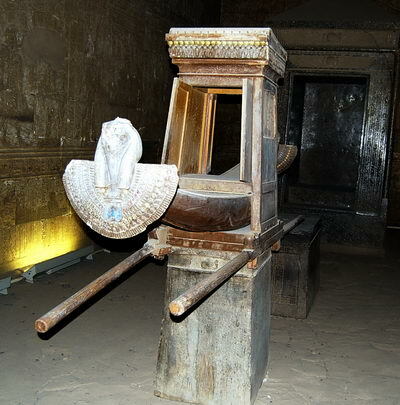 The ark at Edfu. Photo by Ferrell Jenkins. A visit to Edfu demonstrates that, in the Ptolemaic period, we are no longer observing an Egypt ruled by Egyptians but one ruled by foreigners. The prophecy of Ezekiel had been fulfilled. Thus says the Lord GOD, “I will also destroy the idols And make the images cease from Memphis. And there will no longer be a prince in the land of Egypt; And I will put fear in the land of Egypt. (Ezekiel 30:13). Descendants of Ham no longer controlled the land, but it was dominated by foreigners who were descendants of Japheth. In the 7th century A.D. the country came under the control of Arab rulers who were descendants of Shem. This same rule by foreigners now continues in the present Egyptian government headed in recent time by presidents Nasser, Sadat, and Mubarak. 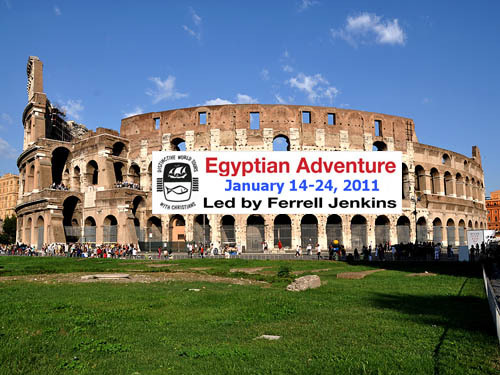 The modern Egyptians are simply caretakers of the ruins of ancient Egypt. We do a lot of studying and learning on the tour, but we also have fun. Of our 42 person on the tour, about 15 have attended Florida College. Two board members are among the group. The college mascot for the sport teams is the Falcon. We posed with Horus, the falcon god, for a photo. Note: I left the boat at Aswan to come to a nice Internet Cafe. It seems that I failed to include the photo referenced above on my flash drive. I will try to get it on later. Note: We are back in Cairo. Here is the photo. 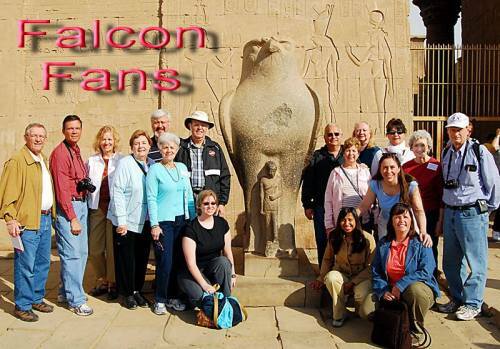 Florida College Falcon fans at Edfu, Egypt. Photo by Sharon Cobb. One of the perils of travel is dealing with the hawkers. There is the guy who approaches a person with a Nikon Digital SLR trying to sell him postcards of the monument he just photographed. I remember a boy in Damascus in 1967 hawking those little inlaid boxes for “Just one lousy American dollar.” We were on a boat taking the canal tour in Bangkok when suddenly a boy comes up out of the dirty water into the moving boat. I like this refreshing sign in a shop at Ephesus. No doubt here! 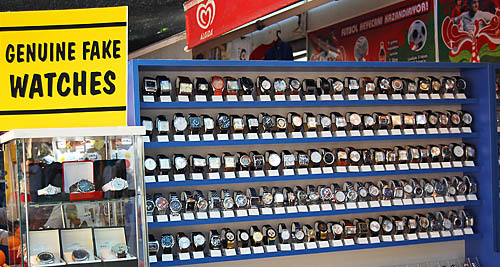 Genuine fake watches in a shop at Ephesus. Photo by Ferrell Jenkins. 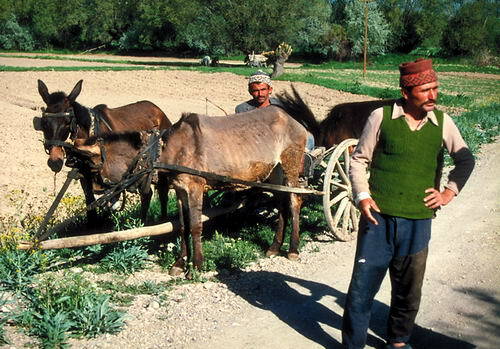 The farmer said, "Ask in the next village." Photo by Ferrell Jenkins. Paul visited Lystra on his first journey (Acts 14). On the second journey he came through Lystra where Timothy lived. From that point on Timothy remained a faithful companion and co-worker with Paul in the spread of the gospel throughout the Roman Empire. Is the Apostle Paul known in your village? I mean, is the teaching of Christ and Him crucified known there? (1 Corinthians 2:2). Claude Mariottini calls attention to a funny archaeology joke. At least he thinks it is funny, and I agree. An archaeologist was digging in the Negev desert in Israel and came upon a casket containing a mummy. After examining it, he called the curator of a prestigious natural history museum. “I’ve just discovered a 3,000 year old mummy of a man who died of heart failure!” the excited explorer exclaimed. Like Dr. Mariottini did, I will send you here for the punch line.